Since starting the renovations to the school library, Sekolah Gunung has been awash with volunteers from all walks of life, willing to donate their time and energies to our school. While covering books with a small group of volunteers from UII, one of our volunteers reveals himself to be a junior doctor with a team of junior doctor friends who have been looking for a place to hold a free medical check-up day in the spirit of charity and giving that is tradition during the hold month of Ramadan. After sharing out experiences from our successful medical check-up day that was hosted by 1000_GURU, and showing the four large boxes of left over medicines from that event, Doctor Romdon’s eyes began to shine. Whilst examining our extensive medicine collection with wonder (a Doctor’s treasure chest!) Doctor Dom excitedly asked if two days would be too soon for a checkup day. After getting blessings and permission from the local village authorities, Dr. Romdon returns two days later with a team of over fifteen bubbly, enthusiastic and charismatic Junior Doctors and medical students. In under two-hours, our school was transformed into a fully functioning pop-up surgery, complete with three check-up areas; for blood testing, blood pressure checking and a pharmacy. Between doors opening at 1pm and when the rains began at around 4pm, our medical team had seen, treated and prescribed free medicine for over 50 members of the village. Thank you so much to everyone who took part in this amazing ‘Bakti Ramadan’ event. Matursembahtenkyu…come back again soon!!! Following the major eruptions of Mt. Merapi in 2010 that claimed the lives of nearly 400 people, the state volcanology department and local government redrew the boundaries of its 3-tiered disaster risk zones or Kawasan Rawan Bencana (KRB I, II & III). Level III, which is the highest, classes an area as ‘forbidden to inhabit, to carry out commercial activities and construction of any kind’. Former inhabitants of the KRB III or ‘red zone’ were given new land and homes in relocation villages known as the ‘Huntap’ or Hunian Tetap (meaning permanent residential area), however due to numerous factors including mental and social well-being, cultural beliefs and economic pressures, many residents have chosen to ignore the government guidelines and return and rebuild their former homes in this area. In 2014 Indonesia launched its first universal health insurance program, which aims to make basic healthcare available to all by 2019. Although admirable, the program is still very much in its infancy and since its launch, has been faced with many criticisms. Firstly, to enrol, an individual must be in formal employment, problematic in a country characterised by a massive informal job sector. Secondly, access to this service is dependent upon private healthcare institutions voluntarily opting to offer services for national insurance holders and thus for remote and isolated areas, access to this service remains very limited. Furthermore, it is reported that both speed of access and quality of care is subject to digression of individual institutions and thus can vary widely from place to place. For the reasons discussed above, the current national healthcare system is still largely inaccessible for the residents of the upper villages of Merapi. 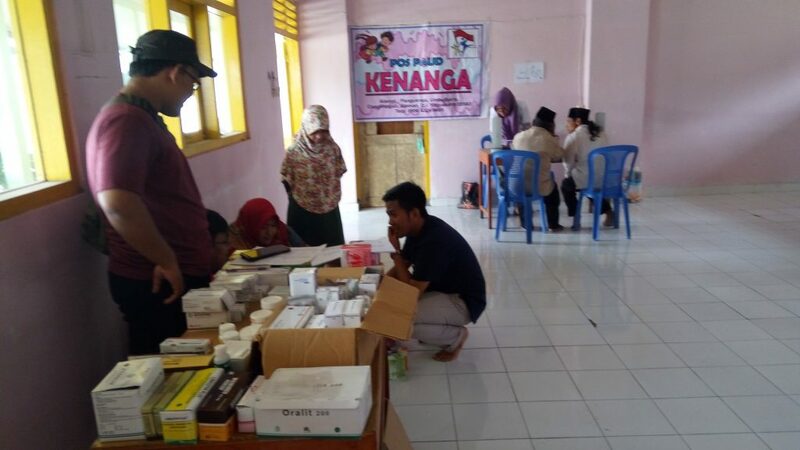 As result, for health services, residents have a choice between the not so local health centre of Umbulharjo (Pusat Kesehatan Umum, or Pus-Kes-Mas) or a private hospital in the town of Pakem. ‘Pus-Kes-Mas’ have something of a poor reputation in Indonesia as being limited to treating the most basic of ailments, and as such are often jokingly referred to as ‘Pusing Keseleo Masuk Angin’, meaning ‘dizziness, dislocations and bloatedness’. The general perception being that any health problems beyond headaches and colds will exceed the health centre’s capabilities. The journey time by motorbike or car to the Pus Kes Mas is approximately 15 minutes, and 30 minutes for the hospital. As a large majority of Pangukrejo’s residents are made up of the very elderly, many of whom cannot drive, both these locations are thus extremely inaccessible and particularly difficult for individuals in need of regular health check-ups or ongoing treatments. In order to address these accessibility issues, we hope in future to be able to work more closely with students and alumni of UII Department of Medicine so as to establish regular, perhaps even monthly free medical treatment for the residents of Pangukrejo village and surrounding areas.